If you are interested in making a difference and volunteering with us check out the volunteer opportunities below, and feel free to fill out a volunteer application and send it to the email below. Click Here to email your volunteer application. Recruitment: Help us create a compassionate army… The bigger we are the more we can do! 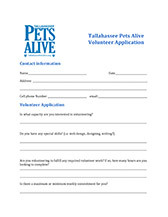 Tell everyone you know what you are doing and how they can also be a part of making Leon County No-Kill! Fundraising: Like to plan events? Fundraising is crucial to saving lives at FPA! Sponsor / Donation Acquisitions: Like to talk to people? Help develop our sponsorship or donation program! Writers: Website content, informational brochures, fliers, presentations, grant applications, press releases, and more. Graphic Design: Work with writers, design media items, T-shirts, signage, etc. Social Media: Help keep everyone up to date with what’s going on at FPA! Mother Hubbard’s Cupboard: Pick up donations for the pet food bank, process applications, database upkeep. Chuck Wagon: Deliveries of pet food to our homebound Meals On Wheels Recipients. No Pet Left Behind: Home visits to assist with pet care to hospice patients. PopStars: Help keep page up to date, remove listings of adopted pets, add new pets, work with shelter/rescues to get new pet listings. T-FANs: Join our foster/advocate network! 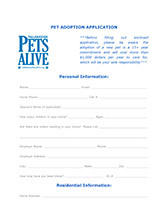 Become a foster and/or advocate for our homeless pets. 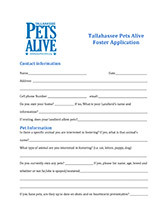 All you need to provide is love and a temporary home for our fosters, and a passionate voice to help save lives. A Spot for Spot: Help with the design and construction of dog houses and feral cat colony housing.